Corinne Langford, Pelvic Floor Physiotherapist and owner of Inner Balance Physiotherapy explains what happens at your Pelvic Floor Physio appointment. Postnatal Fitness - When can you start exercising again? Postnatal Fitness - Healing your body comes first. Slow is fast when you’re making a return to activity postpartum. You need to build that baseline first, hone that foundation, so that you CAN make a strong return. It is so important to take the time to rehab and retrain postpartum. You will get back to doing the things you love. But build that foundation FIRST. 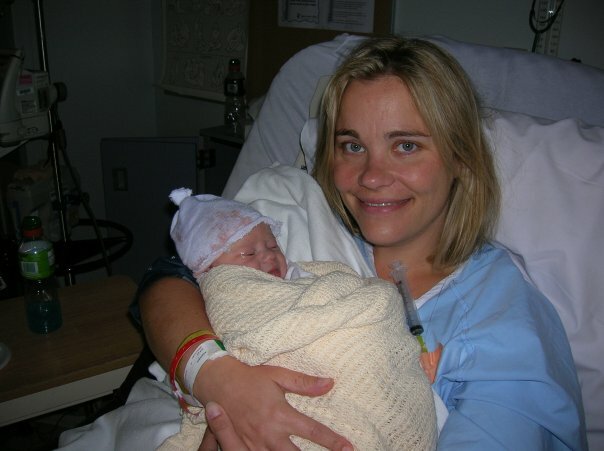 I experienced a traumatic birth with my first child. Forceps, vacuum, episiotomy and 6 weeks later, my GP gave me the green light to exercise. And so I did. Running. Bootcamps. Crunches. All of it. I did not heal my core and pelvic floor before starting back into exercise and until recently, I was still feeling the consequences. I want you to do better. I want you to be able to do all that you want to do. Symptom free. But it takes a little bit of work to get there. After a very long and difficult labour, this little light came into the world. Many women will suffer from some form of pelvic floor dysfunction and they may not even be aware. Or they are aware, but think that it's just part of their new normal. Urinary incontinence, diastasis recti, pelvic organ prolapse, etc. are common but NOT normal. I get asked the question a lot. "When can I get back to running, my regular HIIT classes, yoga classes?" Do you have any pelvic floor dysfunctions? Do you leak when you run? Do you have Diastasis Recti? What if you don't have any symptoms? How do you feel after you go for a run? Or a bodyweight home workout? Do you feel like you're D.O.N.E. for 3 days afterwards? Are you so sore that it hurts to pick up your baby? Well, then you might want to rethink your exercise choices. Was that class/run worth it? Was that 45 minute sweat worth a day of exhaustion? I get it. Sometimes we need that sweat. We need the mental release that exercise gives us. But could you change up your exercises in that postpartum phase? What about walking up a hill or walking stairs? Great for the gluts and you can get your heart rate up. What about giving yourself another month or two and making sure that you're good to go before you get back at it. What if you modify for just a little while longer? You can and will get back to doing what you love. But take some time to heal, recover and rehab FIRST! And enjoy that snuggle time with your baby. It really does go by so fast. Brings attention to core strength and posture which often is hindered by carrying and feeding a new little one. Increases cardiovascular health and improve bone mineral density. Postnatal exercise offers a whole range of benefits for new moms. However, it’s important to remember that you should always consult with your doctor before starting up an exercise program. As well, I HIGHLY recommend seeing a Pelvic Floor Physiotherapist after your delivery. There are classes at big gyms where the instructor doesn't know that you have a 12 week old baby. Where there are too many people for them to give you modifications. There are also a lot of trainers who know what to look for, what to ask and what to modify. I teach classes in Calgary but there are other postnatal fitness specialists all over the world who can help you too. Don't assume that because you can bring your kids that the instructor knows the ins and outs of postnatal fitness. Ask the questions! Every body is different and we can determine a safe route for you. You have Pelvic Organ Prolapse. Now what? Read more about the symptoms of POP and considerations on what to do from here. Prenatal Fitness - What should you do? Safe, suitable and regular physical activity throughout your pregnancy helps keep you and your baby healthy. But it's so confusing. What can I do? Should I continue with this activity? Will this hurt the baby? Can I keep doing what I was doing? Will this exercise hurt my body? So many questions! The answer? Read more. Do you pee when you sneeze? Top THREE things to do if you suffer from incontinence. Incontinence is very common, but it is not normal. Here are the top 3 things you can do about it. Read about my postpartum running story and the lesson learned. You CAN get back to doing the things you love. Take your time. Have patience. You will get there.